Curtains are a significant decor item in our home furnishing. They complete the desired look of our home and exhibit our style statement. They reflect one’s taste and add meaning to our room and that is the reason a lot of time is spent by designers in selecting the right design and patterns. If chosen correctly, curtains induce life and lend a pleasing effect to our interiors. Curtains can be chosen in varied color combinations depending upon the type of furniture and wall color so that they give a professional and a cohesive decorated look. Red and White curtains are a popular color scheme, however before one makes a choice, they must be educated with significance and meaning of these two colors. Red is a color of passion, love and evokes very strong feeling. In using a powerful and a motivating color like red, one must be mindful that while it upsurges passion, it will be very hard to sleep in a bedroom with red curtains. Hence to lower the tint of a red tone, it is appropriate to always use it in combination of another lively color like violet, orange, black or even white. However if you want a sharp impact, nothing beats the red color which comes in variety of shades from elegant burgundy to vibrant crimson and can complement beautifully with your light weight furniture. White on the other hand, white which signifies peace, calm, comfort and cleanliness can send the sharp colors like red to a subdued form. It is one of the reasons that white color is commonly used as a foil by designers to give a complementary look to bright colors and add a light to them. White comes in many shades like a warm white or cool white and one must pay attention to these subtle differences in making a correct combination of red and white curtains. So if you have a living room or kitchen with white interiors, dash up the look with plain or check red and white curtains or if it is just a study, even single red or white color can be used as window treatments if it matches with wall color scheme. Red and white curtains add an appealing pop to your bathroom if used as clear shower curtains with an imprint of leaves or flowers. Many families hang new curtains and decorative items like lights for Christmas. In Christmas time, red and white curtains are in great demand as it resonates very well with festive scheme of colors. It breathes new life to your home with spectacular and beautiful designs of Santa, jingle bells, snow and Christmas trees. They can even make a lovely Thanksgiving gift for your loved ones. 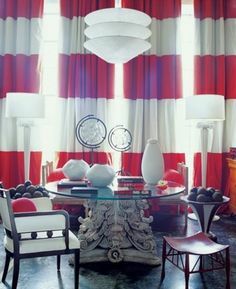 One of the classic color combinations; red and white curtains must be used with great care and attention. While some room may demand a bold red look, others will look pleasing if white takes it over. This fascinating and timeless duo grabs anyone’s eyeballs instantly; hence every room of your house must be treated with different strokes.